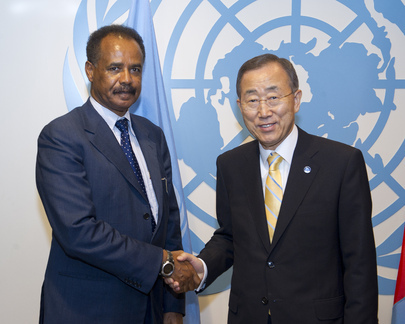 UNITED NATIONS, December 3 -- As the scheduled UNSecurity Council vote on new sanctions against Eritrea on Monday looms, on Saturday the country's foreign minister Osman Saleh wrote again to Council president Vitaly Churkin of Russia asking for more time. Saleh's letter, which Inner City Press received and is puttingonline here, puts the blame for the rush and denial of due process on the United States. The letter does not mention Gabon, the ostensible sponsor of the sanctions resolution. It does not seem that the Council will consider Saleh's letter until Monday morning, the time given at the eleventh hour for Eritrean president Isaias Afwerki to address to the Council. The letter says that such intervention would be "a mere formality" -- the resolution is already "in blue" and ready to be voted on. No provision was made by the Council to consult with capitals after hearing from Eritrea's president. To some it appears that the initially satisfying compromise -- to here from Isaias Afwerki and then vote -- is akin to allowing a defendant to speak only before sentencing, not during the trial. This is a rare and unprecedented case, in which a country faced with Council sanctions has repeatedly asked to be heard, and then asking that the schedule make such a hearing possible and potentially meaningful. Can the Security Council rise to the challenge, despite the insistent pressure of its (by far) most insistent member? Watch this site.